So you love CSI and you can’t get enough of TV shows with crime investigations for themes. You’re practically glued to the screen as you watch forensic experts turn every piece of evidence inside-out just to find clues as to the identities of the perpetrators. If you really love forensics, then you should explore the idea of working in the field of Forensic Science and to be able to do so, you should take courses related to this field. Don’t have the time to attend campus classes? There are online courses for Forensic Science that are offered by some of the best universities in the US. The University of Florida has several online programs for Forensic Science via UF Forensic Science Distance Education. Forensic Science is offered under degree programs, certificate programs and as non-credit courses. Degree Programs are Master of Science degrees that cover various areas in forensics: Forensic Toxicology, Drug Chemistry, Forensic DNA and Serology, and Forensic Science. A Professional Science Master’s degree is also offered with a concentration on Forensic Science. Depending on the degree program, the courses are offered under different college departments of the university. For instance, MS in Forensic Toxicology is offered under the College of Veterinary Medicine; while MS in Drug Chemistry, MS in DNA and Serology, and MS in Forensic Science all under the College of Pharmacy. MS degrees require at least thirty-two credits. For Certificate Programs, Forensic Science is offered in the following specializations: Environmental Forensics, Forensics Death Investigation, Forensic Toxicology, Drug Chemistry, Forensic DNA and Serology and Veterinary Forensic Sciences. Just as the courses under the degree programs, certificate program degrees are likewise offered by specific colleges in the university. All certificate programs are offered under the university’s College of Pharmacy except for Forensic Toxicology and Veterinary Forensic Sciences which are offered under the College of Veterinary Medicine. Certificate programs require at least fifteen credits. 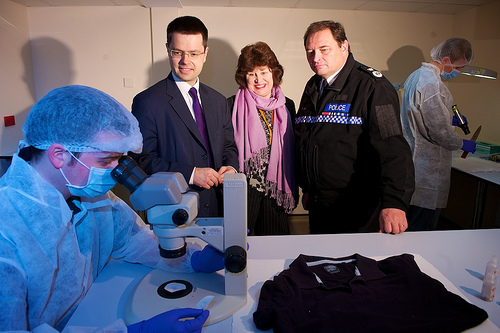 Non-credit courses are generally taken by professionals and even high school students who need basic knowledge about forensics. Non-credit courses under UF Forensic Science Distance Education are Forensic Science for Lawyers, Forensic Science for Nurses, and Forensic Science for High School Teachers and Students. All courses are offered during specific times of the year, generally in the Spring, Summer and Fall. The website provides information on how to enroll in your courses as well as the recommended order of courses to help you transition from one course to the next for a smoother flow of your online educational experience.